SEACAT kicked off on August 22. The United States and several Southeast Asian countries launched an annual maritime exercise in Singapore this week. The 15th iteration of the annual Southeast Asia Cooperation and Training (SEACAT) exercise commenced at the Republic of Singapore Navy’s Multinational Operations and Exercises Center (MOEC) on August 22. SEACAT, which began in 2002 under the name “Southeast Asia Cooperation Against Terrorism,” was renamed in 2012 to expand the scope of training among regional navies and coast guards. The exercise brings together liaison officers from nine participating countries – Singapore, Brunei, Indonesia, Malaysia, the Philippines, Thailand, Bangladesh, Cambodia, and the United States – to collaborate and execute maritime responses to scenarios to better tackle maritime security challenges such as smuggling and piracy. According to a U.S. Navy statement, this year, during the five-day command post exercise, officers will receive simulated reports of suspect vessels at sea, share information from available sources, and then develop and implement response plans during a concurrent field training exercise, with aircraft and ships investigating and conducting on-scene boardings where necessary. Participating U.S. assets include the fleet replenishment oiler USNS Walter S. Diehl, two P-8A Poseidon aircraft, and, for the first time, the USNS Montford Point, which was redesignated as an expeditionary transport dock. 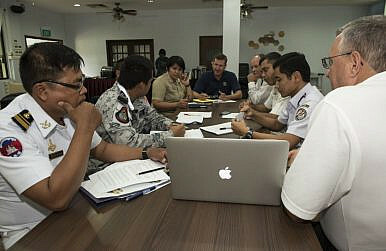 By crafting practical responses to realistic scenarios using actual information sources – including Singapore’s Information Fusion Center, Malaysia’s International Maritime Bureau, or the Philippines’ Coast Watch System – the participating countries hope to hone their communication and coordination so that they will be better prepared to respond when an actual crisis occurs. “SEACAT enables nations to work through complex maritime security challenges in a cooperative and inclusive environment,” Rear Adm. Don Gabrielson, commander of Task Force 73 – a Navy task force which coordinates exercises for Southeast Asia, said in the statement. This year’s iteration of CARAT Brunei kicked off on November 6.